Last fall Intertops Poker and Juicy Stakes Casino launched a revolutionary new game from Betsoft called Max Quest: Wrath of Ra. It’s an interactive action adventure game where players win cash prizes by shooting at enemies. Battling their way to undiscovered Ancient Egyptian treasures, players purchase bullets and special weapons for cash and win when they hit their target. This weekend, the casinos are giving players ten free bullets to try it. 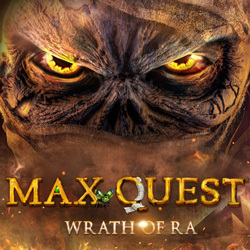 Last fall Intertops Poker and Juicy Stakes Casino launched a revolutionary new game from Betsoft called Max Quest: Wrath of Ra. It’s an interactive action adventure game where players win cash prizes by shooting at enemies.